This long-established surname, now chiefly found in the Midlands, is of Anglo-Saxon origin, and is a locational name from Alsop-en-le-Dale, a chapelry in the parish of Ashborne, Derbyshire. Recorded as "Elleshope" in the Domesday book of 1086, and as "Aleshop" in the 1241 "Registrum Antiquissimum" of that county, the place was so called from the Olde English pre 7th Century personal name "Aelle", with "hop", a small enclosed valley; hence, "Aelle's hop". Locational surnames, such as this, were originally given to local landowners, and the lord of the manor, and especially as a means of identification to those who left their birthplace to settle elsewhere. The surname development since 1175 (below), has included: William Alsape (Cambridgeshire, 1273), and Philip Alsope (Cambridgeshire, 1279). In 1538, one Thomas Alsop "gentleman potycary" to Henry V111, was recorded in the "Privy Purse Expenses of Princess Mary". In the modern idiom the name has a number of spelling variations ranging from Allsop, Al(l)sopp, Allsup(p) and Allsep(p), to Elsip and Elsop. 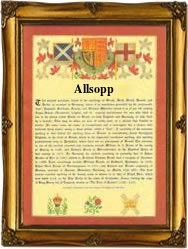 A Coat of Arms granted to the Alsop family of Alsop, Derbyshire, is a black shield with three silver doves rising, legged and beaked red, the Crest being a gold dove with wings expanded, beaked and legged red, holding in the beak an ear of wheat gold. The first recorded spelling of the family name is shown to be that of Gamel de Haleshoppe, which was dated 1175, in the "Pipe Rolls of Derbyshire", during the reign of King Henry 11, known as "The Builder of Churches", 1154 - 1189. Surnames became necessary when governments introduced personal taxation. In England this was known as Poll Tax. Throughout the centuries, surnames in every country have continued to "develop" often leading to astonishing variants of the original spelling.